LaBellaVida: Gifts Vouchers Blogger Challenge! This post is a challenge post created by Gifts Vouchers @ giftsvouchers.co.uk for bloggers to find and post about 5 presents for Christmas, birthdays or any occasion but they all must be under £35 in price! Fashion Workbook £12.90 from Topshop -here. Cute little fashion book which follows the creative processes of fashion designers and gives fashion conscious ladies inspiration and insight into fashion as well as being a bit of fun! I want this for myself! Headphone ear-muffs £20 from John Lewis - here. It's winter in the UK, it's freezing. You need these. They're so cute and fashionable at the same time as keeping you warm during the winter months! Great gift for any music loving ladies... or gentlemen if they really wish! MAC All for Glamour Touch-up Kit £30 at Debenhams - here. Cute MAC makeup in the cutest little storage box. 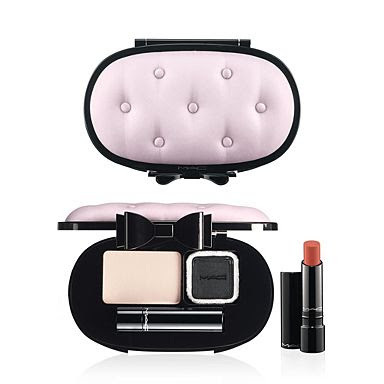 It contains pressed powder and a lipstick, great for everyday little touch-ups, won't take up much room in your hand bag and is really pretty to look at! It might only be me that thinks this is quite a clever present. It is basically two hampers, one has loads of retro sweets for your last 'fat treat' while the second contains all healthy motivational products including a fitness dvd, skipping rope and twinings green tea for after you have eaten all your fat treats! Quite a fun, clever present for people who always use the 'diet starts tomorrow' line..(myself! haha). Jolly Hollydays Gift Box £25.50 from Lush - here. Lush always has amazing Christmas smelling soaps, bombs and lotions and i just think this box is really cute with the santa bath bomb and Ponch Shower gel which is inspired by traditional Mexican Christmas punch and contains a shot of tequila! Party in your shower! That was my 5 under £35 gift ideas for Christmas! Do you like any of these gifts? Will you be entering gifts vouchers blogger challenge? You can get all entry details by clicking here! Maybelline's Fit Me - First Thoughts! Drugstore Face of the Day! Simple Outfit of the Day! Collective Basics Beauty & Fashion Haul!